St. Martin’s Day, also known as the Feast of St. Martin, Martinstag or Martinmas, the Feast of St Martin of Tours or Martin le Miséricordieux, is celebrated on November 11 each year. 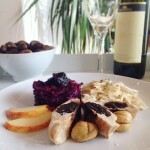 In Slovenia, St. Martin’s Day (Martinovanje) marks the day when the must traditionally turns to wine. The must is usually considered impure and sinful, until it is baptised and turned into wine. 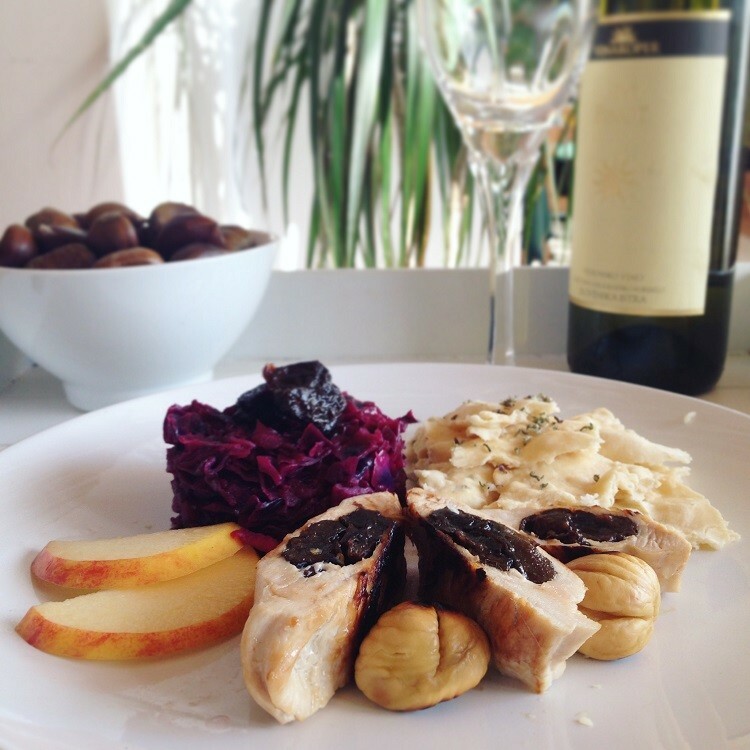 The foods traditionally eaten on the day are goose and home-made or store bought mlinci. In Slovenia, we celebrate St. Martin’s day for a whole week in case November 11th falls on a weekday. I decided to make homemade “mlinci” this year to be able to make them with spelt flour, but the red cabbage is made following a traditional recipe. Instead of the traditional roasted duck or goose, I decided for a little twist and made stuffed turkey breast with dried plums. Recipe for all of the above are super simple so there is no reason not to make this feast this weekend. Or any other day of the year! 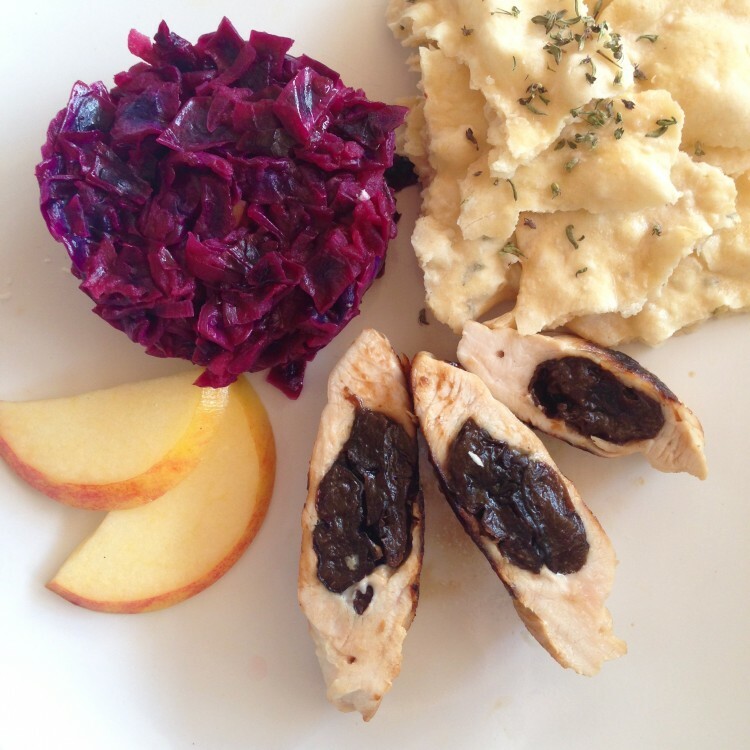 Spelt thyme mlinci, red cabbage with apples and cloves and turkey breast stuffed with dried plums are the perfect Autumn combination to celebrate must turning into wine. Place all ingredients in a large bowl and knead into soft dough. Divide into four balls and roll each one out to about 2 or 3 mm thick. Place on a baking tray with baking paper and bake for 15 minutes or until bubbles start to form and turn slightly brown-ish (turn the heat up to 220 degrees Celsius for the last 4 minutes). Let cool completely, then break into small pieces and store. When ready to serve, pour warm vegetable stock over mlinci and let sit. Drain any extra liquid and serve. Slice the cabbage in desired sized pieces and cover with some lemon juice. Peel and grate the apple and cover with remaining lemon juice. In a medium pan with olive oil, cook the onions until translucent. Pour over some vegetable stock and add the cabbage. Season with salt and cloves and cover. After 10 minutes, add the apples and cook for additional 10 minutes or longer, if you want the cabbage to be less crunchy. Using a knife, cut a whole in the meat to form a pocket for the plums. Stuff with dried plums and seal with toothpicks. In a medium pan girll the meat on some olive oil on both sides. The time of grilling depends on the thicknes of your fillet. Slice the meat into 1 cm thick strips and serve with soft mlinci and warm sweet red cabbage. And of course some wine!